I will be the first to admit it took me some time to jump on board with the idea of patterned pants. In fact, I wrote a whole post about their resemblance to clown pants. Needless to say, I’ve moved past that. The more our brain is exposed to a new trend the more we grow accustomed to it and accept it as the new normal. I haven’t bought a pair of patterned pants in a while simply because I don’t like buying pants. I hate trying on pants. My top three list of things I hate shopping for most are; bathing suits, bras, and pants. 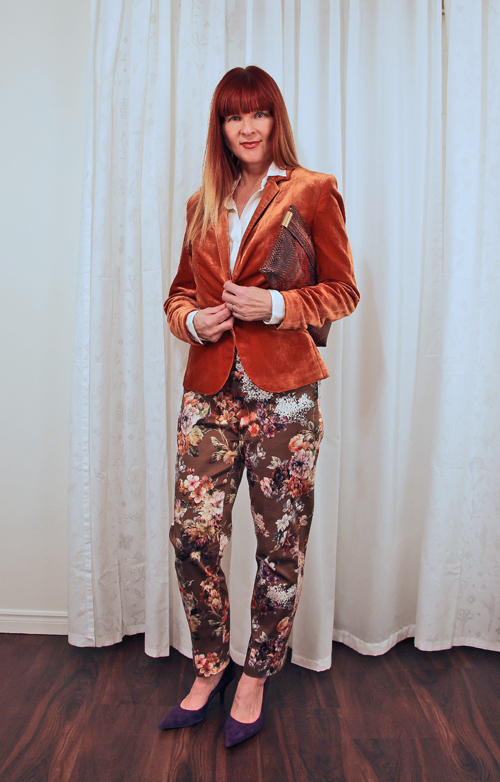 These new printed pants were on super sale at my consignment store. They were new with tags on, from Anthropologie and were reduced an additional 50%. I had a credit at the store from taking in items I no longer wanted and therefore I was able to walk out with these in my bag without ever opening up my wallet. My husband is ecstatic. 1. Pair them with a neutral top. 2. Select one of the colours from the print on the pants for your top. 3. If you’re mixing another pattern with the pants ensure that it is either larger or smaller than the print on your pants. Smaller patterns will read as texture to the eyes. Another trick with patterns is to have a darker background for one pattern than the other. You can barely see the top I’m wearing below, as it just peaks out of the blazer, but the pattern is on a black background. 4. If you pants are tone on tone in a neutral colour, your choices are limitless for the top colour. 5. Choose a coordinating colour in the same saturation for the top. I think these new Anthro pants are going to look even better when I finally drop the baby weight. And by baby I mean Cheezies and peanut butter squares. Do you own any patterned pants? Any special tips you’d like to share about how you style them? Suzanne—I know I say it all the time, but you crack me up!! But now I love them again! And really they hide the baby weight perfectly—ha ha! Because as I’ve found with print tops, you really don’t notice the lumps & bumps like you do with the solid colors!! I also love the ribbon (?) trim down the seam of the legs—super!! Prints can hide a gluttony of sins! Maybe that is why I love them so much! I love print pants. Well I pretty much love print anything. But most of my print pants are of the wide legged variety. I have been toying with the idea of some skinny print pants though. I remember wearing them back in the…. well,never mind that. So this post has inspired me to give them a try once again. Always happy to have a new thing to shop for! Well, you can’t go wrong with stripes, as you well know. Baby weight? Hahaha. At least you don’t have to drop your baby teeth, which, by the way, are all the rage. Bwahaha. I love your galleries of photos. You have so many great shots to choose from – how on earth can you decide? And I’m glad you’re a pattern-pant convert. You have to get pants when they are practically free! Great post as usual! You own great patterned pants! And what great deals you get! 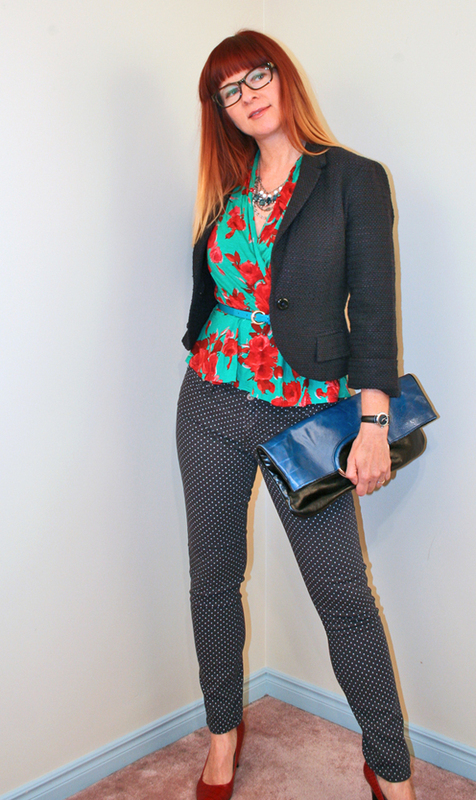 It’s so fun to style patterned pants, especially with some pattern mixing. Patterned trousers are fun to wear, making a statement but looking chic. The outfit with the magenta heels and the harem(ish) trousers made me think again about this cut of trousers. I always worried it would look a bit “nappy-like” but you have made it work beautifully. Then I spot them again with the blue peplum….and again with the yellow heels. Those nappy pants do have a tendency to look like diapers. I think I wrote in one post that I felt I could fit an entire turkey dinner for 10 down my pants. I ended up taking them in quite a bit and hiking up the waist as well. They are very high waisted now which suits me better. Like you, I was against patterned pants but now I’m singing a different tune. I learned they can be pretty, even on someone like me. You look great in these. I don’t know that they are my best choice for my body type, but I still like them. I would think with your gams you could wear them easily. Thanks for the vote of confidence. For that reason, I picked up three pair recently at thrift-stores (very cheap). Have to figure out how to style them. BTW, Has anyone told you lately how wonderful you are? If not, let me. YOU ARE A WONDERFUL PERSON, SUZANNE, AND WE’RE LUCKY TO KNOW YOU. Ally, Hope to see your stylings soon! I find that it’s the patterns/prints that make me salivate first. It’s crazy how exciting I find just walking through the upholstery section of a fabric store. The tribal prints, batiks, paisleys and English florals are just incredible!!!! I love prints in skirts and pants/jeans. A few of those you modeled are in my GORGEOUS category. I think your styling is wonderful Suzanne. Sometimes I think these prints I love aren’t particularly slimming and I wonder if they’re my best choice. Happily a uniquely great pattern sweeps me off my feet and I continue to buy and wear them proudly. I even added that cute stripe down the side to a pair of jeans myself once. I used some fabric trim and had to do it by hand but it worked out well! I 100% agree with you that bold or larger prints on pants are not the most figure flattering. That is what I wrote about in that “clown pants” post. I know that they visually shorten my legs and add a few additional pounds. Like you though, I’m a sucker for a great print and will sometimes simply ignore those facts and wear them anyhow. Bravo for making your own stripe down the side. That must have been time consuming by hand. I’ve noticed that printed trousers (pants are forever knickers to us Brits!) are everywhere this Summer, loads of the young and hip festival goers are wearing them and they look great, a great change from the the ubiquitous black leggings. 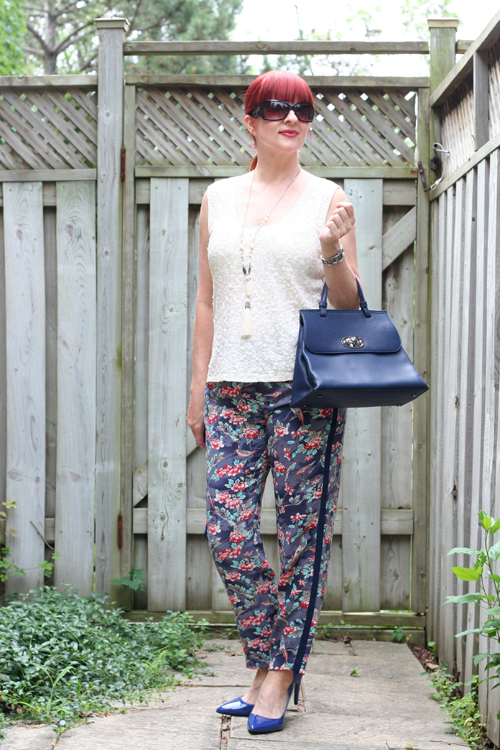 Wow great looks Suzanne – patterned pants are not that easy to style you made it seem so simple! I’ve owned a few pairs of patterned pants (I think the only pair I’ve kept are plaid). Most of mine are solid colours, but I love wearing patterned leggings as tights with dresses and skirts in the winter. You’ve styled all of these pants beautifully. The floral ones are my favourite too. 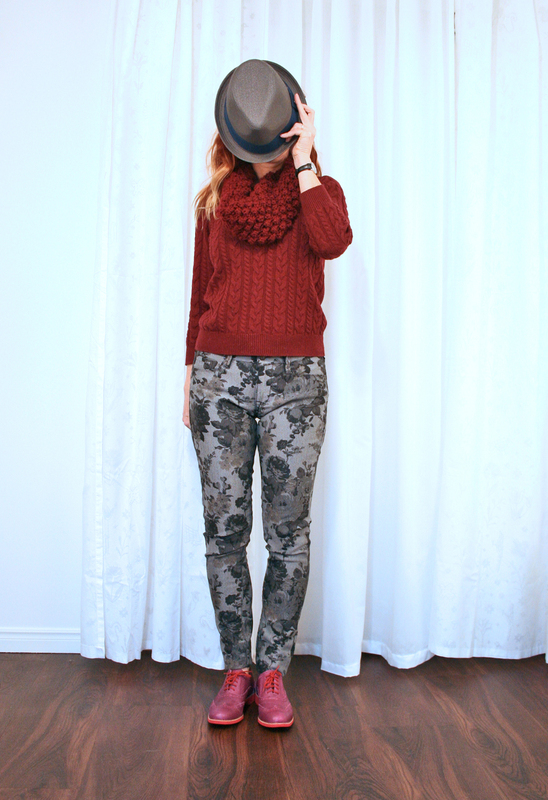 LOVE all the different ways you showed how to style them! 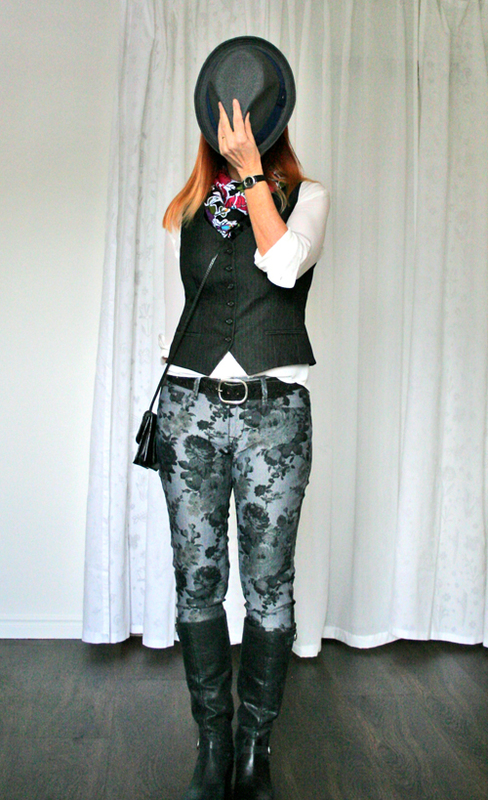 I do believe that I currently do not own any patterned pants…probably because I too, hate to try them on! I haven’t got one pair of … oh no I do. Not very exciting ones but I do own a few pairs. I always pair them with solid colours ascI am terrible at pattern mixing (watch my post of the 14th… you’ll laugh). I think you did so well and I am glad you had the diaper pair taken in. I think it will indeed suit you better.